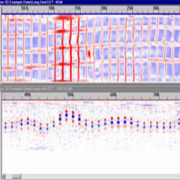 GPR gives the coring professional both a 2-D and a 3-D image of the structural reinforcement inside of concrete structures. This allows for post-tension cables, steel reinforcement and conduits to be identified prior to drilling or sawing. 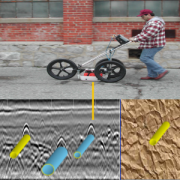 GPR can be used to detect voids beneath pavements in 2-D display. 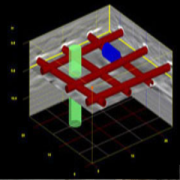 This example demonstrates GPR’s ability to accurately locate a two inch void beneath a reinforced concrete pavement. 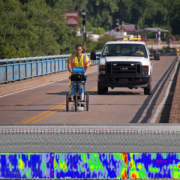 When using GPR for highway applications, depth measurements of multiple pavement layers can be taken at speeds up to 40 m.p.h. GPR can locate saturated sub-grade areas beneath the pavement surface to identify areas that need to be rehabilitated to prevent premature pavement distress. 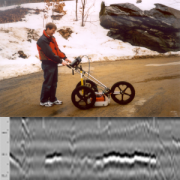 GPR can be used to locate underground utilities in real time. 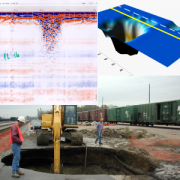 GPR data can be post-processed to graphically display the utilities in a 3-D format. 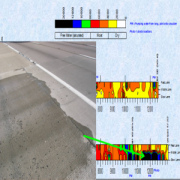 GPR is used to quantify the deteriorated areas within concrete bridge decks. This helps the bridge designer identify areas within the bridge deck that either need repaired and/or replaced. GPR Engineering along with its associates can provide many general civil engineering services. Our current staff can provide services for Site Design, Geotechnical Investigations, Construction Monitoring and/or Testing, Pavement Design, Robotic Pipe Inspections, and Rezoning Assistance. If soil conditions allow, GPR can identify the extent of sink holes. 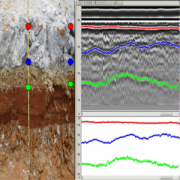 GPR data is collected in the field and then post processed to produce three dimensional graphs. 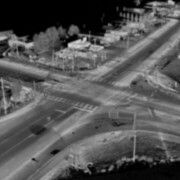 Everything you need to know about an objects size, shape, and location can be precisely scanned and measured with our LiDAR imaging system. We also offer value added design services for your point clouds and 3-D models by assisting with our team of licensed engineers, CAD designers, and licensed land surveying associates. GPR Engineering has partnered with Concrete Coring Company to provide advanced concrete cutting services to Kentucky and surrounding areas. Concrete Coring Company is Central Kentucky’s largest and most experienced cutting contractor, and is able to deliver high quality results at affordable rates. Concrete Coring Company clients include industrial, commercial, and residential contractors. Please visit their website at concretecoringcompany.com.